BRIC is an acronym that refers to the countries of Brazil, Russia, India and China, which are all considered to be at a similar stage of newly advanced economic development. The collective strength of the BRIC economies (Brazil, Russia, India and China) is of ever increasing importance to the strength of the global economy. The BRICs are forecast to account for 37% of global growth in the period 2011-2016, with China alone contributing 22%. This will increase the BRIC share of global output from 19% to 23%. In 2012, Businesses in India had an expected revenue increase of 82%, ahead of Brazil (78%), China (74%) and Russia (43%). In terms of profitability, China leads the way with 61% of raise in profits in 2012, ahead of Brazil (60%), India (57%) and Russia (42%). Comparatively, the export prospects are far higher in India (36%) and China (28%) than in Brazil (16%) and Russia (6%). BRIC governments have been investing recently is the bidding for and hosting of major sporting events such as the Olympic Games and the FIFA World Cup. Main industries include BRIC Diabetes Drugs Market, Beer in the BRIC, Cereal Bars, Dental Floss, FABs in the BRIC, Oral Hygiene, Analgesics, Sugar Confectionary, Vodka, Facial Care, Women’s Wear, Footwear, Computer Hardware, Consumer Electronics, Apparel Retails, Oil & Gas, Renewable Energy, Agricultural Products, Insurance, Residential Construction, Industrial Construction, OTC Healthcare, Electricity, etc. 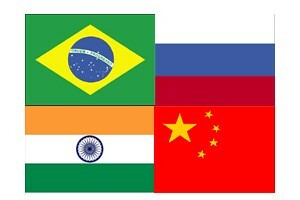 Brazil, Russian Federation, India and China (BRIC) are the emerging and fast growing countries within the metals & mining industry and had a total market value of $1,776.4 billion in 2011. China was the fastest growing country with a CAGR of 19.3% over the 2007-2011 periods. Among the metals & mining industry in BRIC nations, China is the leading country with market revenues of $1,411.4 billion in 2011. China is expected to lead the metals & mining industry in the BRIC nations with a value of $2,632.1 billion in 2016, followed by India, Russia, and Brazil with expected values of $255.8, $244.4 and $86.9 billion, respectively. The BRIC countries are fastest growing countries within the software industry and had a total market value of $25.2 billion in 2011. India was the fastest growing country with a CAGR of 19.3% over the 2007-2011 periods. China is the leading country among the BRIC nations with market revenues of $14.6 billion in 2011. China is expected to lead the software industry in the BRIC nations with a value of $28.5 billion in 2016, followed by Russia, India, and Brazil with expected values of $6.3, $6.1 and $5.1 billion, respectively. BRAZIL: Azul, Petrobras, Embrapa etc. RUSSIA: Kaspersky Lab, ABBYY, Rosnano etc. CHINA: Dawning Information Industry, Huawei, ZTE etc.